Some snaps from the previous week! Briony here! I have been thinking that I want to do a post each week to share little bits about my life. The goal is to try and do 52 in the whole year. *starts to have a panic attack* Key word try. I think this would a great way to share little bits about my life and something that I can look back on later. I know I have grown, matured, struggled and changed so much in the previous year. Having this series will allow me to see the changes I have made along with letting you see them too. I have had most of this week off, thanks to public holidays and taking annual leave. Where I work had been crazy busy leading up to Christmas so I felt I deserved some extra time off. However this week I've mainly been cleaning and trying to de-clutter my life. I am not going to lie, I am a bit of a hoarder and it's something I hate about myself. My biggest struggle is getting rid of something that someone else gave to me as I feel guilty and can't stop thinking about the time or effort someone put in to getting me the item. I am trying to use the mindset that if I am not using it and won't used, it is better off being donated, so someone else can have it. 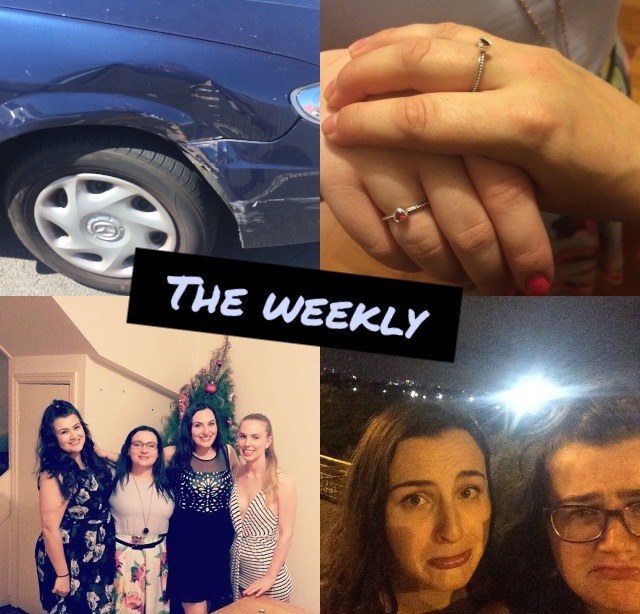 Another big thing this week is I accidentally ran my car into my fence! Stupid, I know, and all my own fault. I got flustered and when I was reversing my car I was only looking behind. No matter how much experience with driving you have, you can always make mistakes! So please always be alert when driving and never drive when under the influence of alcohol or drugs. #lifelessonswithbriony. I also had my first Personal Training session in around 2 months. My trainer had gone overseas and got back in early December. This week I finally booked another session in and I'm ready to work hard and get fit for 2016! Motivation come at me, plz... It is amazing how you feel after working out and it is something I hope to remember this year! A goals post coming your way soon! It wouldn't be the first week of the year if I didn't mention New Years Eve! Mine was pretty chill but I had an awesome night with some of my best gal pals. We went to a party where we got to chill in a kiddie pool, see some up close fireworks and boogie the next away! Also so many photos!!! Finally on Saturday night I went and got Messina ice cream with another bunch of girlies. After scoffing down our ice cream in a seedy park we decided it would be fun to go and find a pretty look out. We went on a hunt for the Ruckers Hill look out and all I can see is what a let down! The journey was more fun than the destination this time.